Maintaining a healthy body mass index (BMI) is essential to ensure strong bones and the success of various functions in the body. A person's BMI is based on their weight in relation to height, and when this figure works out to less than 18.5, this may suggest the person is underweight. Gaining weight in a responsible way is important; while it's tempting to reach for the fast food, such options usually contain high levels of salt and saturated fats. Drinking protein shakes to gain weight could be a solution. Protein is estimated to make up around half of the body's dry weight; brain cells, muscle, skin, hair, and nails are just some of the protein-based parts of the body. It is also vital for growth and repair, meaning that it plays an essential role in healthy weight gain. The body is unable to store protein, so humans must consume it on a daily basis. The recommended daily intake (RDI) of protein is dependent on weight, age, and health; generally, however, for women it is 0.75 g per kilogram of body weight; and for men, it's 0.84 g per kilogram of body weight. About 15 – 25% of a person's energy intake ought to be from protein sources, but if your BMI is low, it is a good idea to increase your consumption by drinking protein shakes to gain weight. Keep reading for natural, tasty protein shake recipes. Almonds and other nuts – a great source of protein – also contain good fats to promote weight gain and are tasty shake ingredients. Blend a handful of chopped almonds and a tablespoon of chopped pecans with 200 mL of whole milk and half a chopped banana. Sprinkle with chopped peanuts. 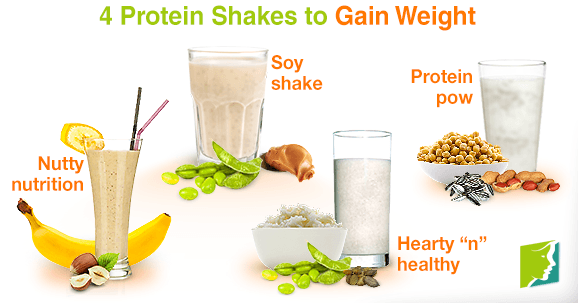 Legumes, like soybeans, are viable sources of protein, so soymilk is a workable base in your homemade protein shake. One cup of soymilk contains 8 g of protein. To make this shake, use 200 mL of soymilk, add a tablespoon of peanut butter, and blend. Sprinkle with chopped pecans. For a filling and protein-packed shake, blend a handful of cooked rice with soybeans and milk; sprinkle with pumpkin seeds. Adding just two ounces of pumpkin seeds provides about 17 g of protein. This protein shake is best consumed in small portions for energy bursts; blend chickpeas, peanuts, and sunflower seeds with soymilk for an energy burst to keep you full between meals. When you are trying to gain weight, it's important to consider your diet just as carefully as you would if you were trying to lose weight. What you eat will affect the way you feel as well as your BMI, so resist the temptation to gorge on junk foods, as these will leave you sluggish and bloated. Using protein shakes to gain weight should only be a starting point; eat plenty of carbohydrates and omega-3 fatty acids (i.e., “good fats”, found in avocado and oily fish) to keep your diet varied while you gain weight healthily.